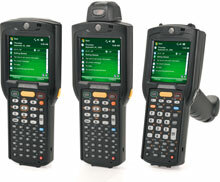 The rugged Motorola MC3100 Series, available in batch-only, is at home in the retail store and warehouse aisles, on the loading dock and out in the yard. Leveraging Motorola's new mobility platform, the MC3100 Series offers advanced computing power, industry-leading data capture capabilities and superior ergonomics. MC3100-RL2S03E00-KIT	 MC3100, Starter kit bundle that includes the PDT (MC3100 Mobile Computer Batch-only, Bluetooth, Limited Audio, Rotating Head, 1D Laser SE950, Color-touch display, 28 key, Standard Capacity Battery, CE 6.0 Pro, 256MB RAM/512MB ROM, English, World Wide) and all starter accessories	 Call for price. The Motorola MC3100-RL2S03E00-KIT is also known as MC3100-RL2S03E00-KIT	or MC3100RL2S03E00KIT	.